It is near impossible to over-praise this perfect little anthology. 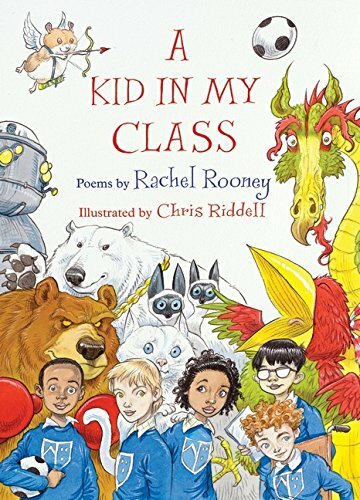 Rachel Rooney’s laconic verses about a typical selection of primary school pupils are at times uproariously funny, elsewhere quizzical, compassionate and occasionally just a bit sad. Young readers will have no problem recognising both themselves and some of their classmates as one poem follows another, where asking a question of the class know-all is ‘speedier than googling Wikipedia’ and ‘occasionally he will bore us, but he makes a great Thesaurus.’ Chris Riddell’s facing illustration shows an invented scaly Thesaurus Rex monster scowling at a fat reference book. This is just one of his many brilliant takes on each poem’s theme while also introducing elements of his own wonderfully anarchic humour. A gerbil runs through many of his pictures; making its own implied comments. Elsewhere childhood faults and fears re-emerge as giants or dragons. Reading from this book aloud to a class could be problematic, given that Rooney’s sense of humour is sharp as well as perceptive. Already unpopular pupils so mercilessly skewered in print here would not welcome the mocking laughter directed at them that would be sure to follow should a whole class become involved in hearing particular poems. But for private reading, the chance to crow over such a comprehensive range of very human quirks, bad habits and personality defects atomised so memorably in print and illustration is not to be missed. This anthology must surely now be a top contender for the next CLiPPA (CLPE Poetry Award).